On the other hand, there are those who believe signup popups are an effective tactic for acquiring new subscribers, in a fast and easy way. A smart, user experience-led email registration popup can help you grow your email list and effectively segment subscribers. What´s more, according to Email Audience, visitors who subscribe to carefully-thought-out email popups are likely to spend more time on your website, and convert more. So how do you make the most of this potentially very powerful tool for growing your email list? In this post we’ll give you 8 helpful tips for successfully implementing (or improving) an email signup popup on your website, along with great examples from 40 retailers we’ve analysed. The optimum time for launching an email signup popup will depend greatly on your business model, but the majority of retail websites show their popups on their homepage within the first 3 seconds of the session, to avoid interrupting a purchase. Other retailers trigger them to appear only when the visitor browses a category page or a specific product, so once they detect some engagement. But the truth is, there is no right or wrong timing - you must test different options and decide which works best for you in acquiring new subscribers. When deciding on how much information you should ask for, the most important rule is to keep it short and simple. Nobody wants to spend more than a few seconds filling out a form - remember that you’re interrupting the visitor’s experience. By asking for the right personal data, COS are able to segment subscribers and group them efficiently by gender and country. The quality of your newsletters is another matter, but keep in mind that the subscriber will have certain expectations when they sign up. Don’t make them regret giving away their email address (and eventually unsubscribe) - make your emails personal and relevant to increase email conversions. Another great example of a smart, straightforward email popup is the one from AQ/AQ below. They have a single button to register - you either subscribe to the women’s list or to the men’s list. AQ/AQ make it super easy to signup with one single click, and also shout out their incentive (more winning points here). Engage the visitor with an incentive that will make it impossible not to sign up. Free shipping, an exclusive first-purchase discount or a prize withdrawal are generally good ways to lure your visitors to sign up (or at least to answer predictable questions like ‘what’s in it for me? why should I give you my email?’). Powerhouse Fitness engages you from the moment you arrive - who could pass up the opportunity to win a £250 voucher? A prize draw can be an excellent way of getting emails from first-time visitors, as the incentive is crystal clear in the popup. Powerhousefitness only require an email, which makes the subscription process very quick. Pretty Little Thing’s email popup clearly highlights the value proposition of signing up, and even the button to register alludes to the incentive - ‘Get my promo code’. 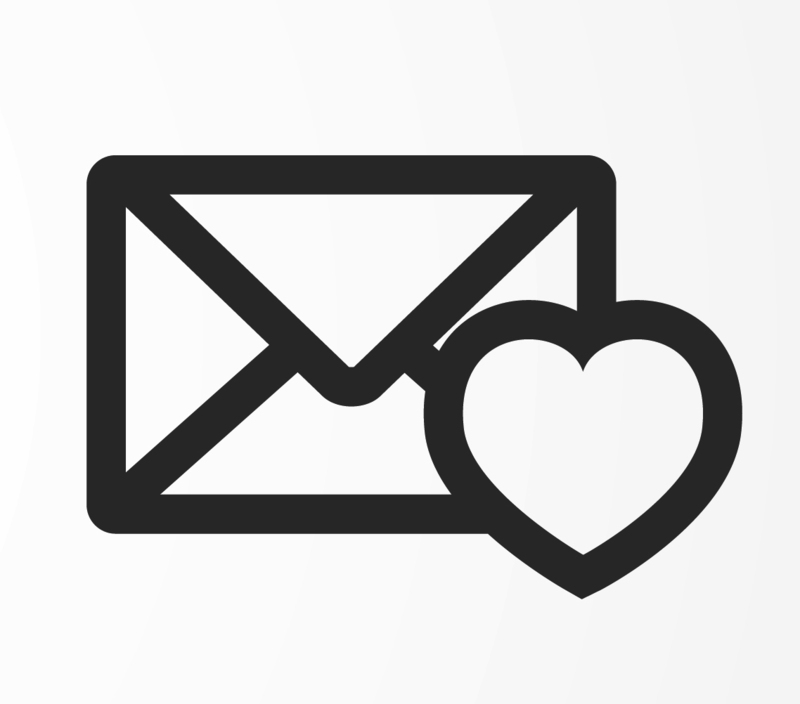 Visitors often skip email popups because it isn’t clear what the subscription will imply. Am I getting discount vouchers if I sign up? Am I getting invitations to exclusive events? Will I get a preview of new collections? Without an explanation or some clue about what they’re signing up to, visitors may simply choose not to give away their details. The good news is you don’t need a lot of text. Some of these doubts can be easily answered if you simply state what your newsletters will entail, and (even better) how frequently you will be sending them. Straightforward and engaging, this popup by Temperley London clearly lives up to what the typical high-fashion lover would expect from a top designer (new arrivals alert from a top designer? New collection preview? Yes please!). A number of web shoppers are still very concerned about personal information being shared with third-parties, or used for other undesired purposes (nobody wants a flood of irrelevant emails coming in to their inbox). Aphrodite 1994 state on the bottom of their popup that you are registering to a weekly communication (frequency detail) and provide the link to their privacy terms. Adidas also use most of their popup space to provide the detailed conditions the visitor is agreeing to, plus how to redeem the incentive. By adding a privacy statement, they are providing a guarantee that their brand can be trusted. Wolf & Badger’s email popup is one of our favourites, as it’s engaging and very efficient at letting the visitor choose how to signup. By giving you the choice to you sign up via Facebook, Wolf & Badger invite you to be part of a community, while at the same time they get access to both your email and Facebook ID. And to avoid privacy concerns discussed previously, they highlight that they won’t post without your permission. As for the other option of signing up with your email address, it is also smartly implemented, as they request visitors to create a password, which means they automatically create an account - killing two birds with one stone. Accessing Facebook profiles is tremendously powerful for marketing segmentation purposes - just think about all you can do with Facebook custom audiences. 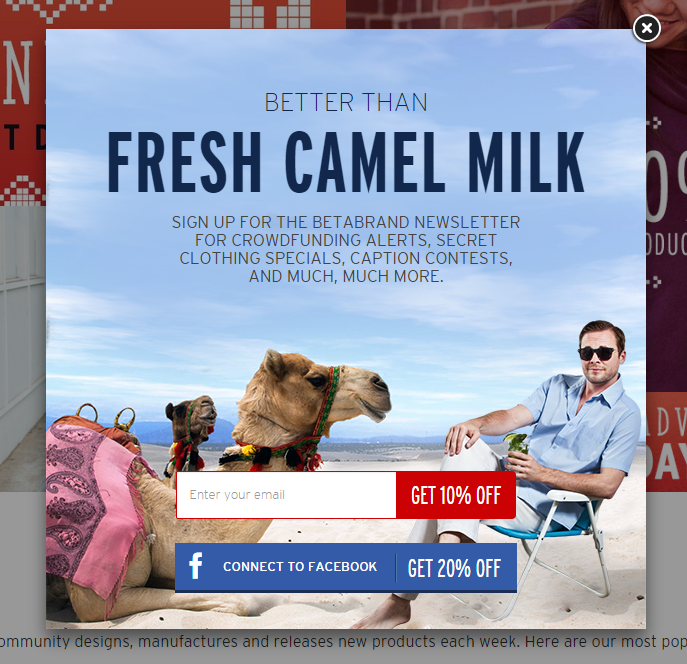 Betabrand’s popup is also a brilliant example of cleverly integrating social media and getting more than just an email. They not only allow you to signup with your email and get a discount, but even offer you a better incentive if you signup using your Facebook profile. Nobody wants to be in the dark after giving away personal information. Once the popup closes, you need to help subscribers trust your brand by simply acknowledging and welcoming the new subscriber. You can do this by either by confirming their subscription in the popup or by triggering an immediate welcome email. Rue La La is a great example of a confirmation message on popup. Oliver Bonas not only place a big cross on the top right of the popup but also give the visitor a second chance to sign up later, if they click ‘Remind me later’. This is a smart strategy to let visitors first browse and interact more in the webstore, and then get a popup reminder which they agreed to if they clicked it. Similarly, Volcom also have a two-way escape exit, making it easy for the visitor to get rid of the popup. They have a visible cross on the top right of the popup, and a ‘No thanks’ link under the ‘Sign up’ button. We hope you now feel a bit more encouraged to give email popups a go, or simply improve them if you’re already using them!